Love yourself, girl, or nobody will — Essie Marie. Okay, so this isn’t a “I hate Valentine’s Day” post. It’s a “what I think Valentine’s Day should be about post”. Valentine’s Day is fun. Red and pink have always been two of my favorite colors, candy is my favorite food, and love is my favorite emotion. So trust me, I love all things Valentine’s day. But hear me out. We celebrate romantic love, instead of self-love. We hold on to the idea that we must have two to tango and if we don’t, then we have nothing to celebrate. But why can’t we celebrate being Ms. Solo Dolo first? Even if we have a significant other/spouse? Imagine if for one day, the whole world stopped. And we celebrated our love for ourselves. Like, what if we put aside all self-doubt and insecurities, and regrets, and just celebrated ourselves. Like what if we really celebrated ourselves? I think that our lives, or at least the month of February, would drastically change. We’d be happier, and remain the independent women that we were all other 11 months of the year. Who needs to wait for a man to buy you chocolates and roses? (P.S. Babe, I really love my gifts, I’m just trying to prove a point here). Seriously though, how many of us know someone who cringes as the calendar strikes February 1st because... Valentine’s Day is approaching and they don’t have a Valentine to buy them the same chocolate and roses that they could by themselves? I know many people. And before I found my husband, I know I always felt this way. But if I think about it, every Valentine’s Day that I was single, I always had someone. Myself. And that’s damn sure enough. And I’ve always had my girls, they’re the best Galentine’s a girl could have. And I have a man who loves me dearly, but without my own self-love, how much could he really love me? Self-love is vital to any healthy relationship, whether it be romantic or platonic. J. Cole says it best. “Love yourself, girl, or nobody will”. If you think about it, can real romantic love exist and prosper if self-love doesn’t exist first? My answer? No. You can’t love someone else, and truly give them your all, if you don’t first love and take care of yourself. This year I decided to throw a Galentine’s day celebration. This was important to me because before we were married, or had boyfriends or were single and ready to mingle, we were just girls. Girls who need love. In a world where women are taught through social media and advertisements, that they are never good enough, my girls needed to hear this from me. We as women, need to be reminded that it’s okay to love yourself, and to be forward about it, and that praising ourselves doesn’t make us arrogant. So I asked the girls to go around and share one thing they love about themselves and one thing that they need to learn to love.. I shared as well. And let me be the first to say that it felt so unnatural to share. As if talking about what I love about Essie, was foreign. It actually took me a few minutes to “come up with an answer”. But if you asked me what I love about my husband, I could answer before you finished asking the question. During this moment I learned a little more about myself. And that I need to be more self-aware, and not only of my flaws. Because I promise you if the question had of been “what do you not like about yourself” I would have been the first to answer. So I vow to express self-love, just as I express love to my husband, and to my friends and family. During the party we wrote love notes to ourselves, I told everyone to seal the envelopes and to read any and every time they needed a pick me up or a reminder of how much they are loved! 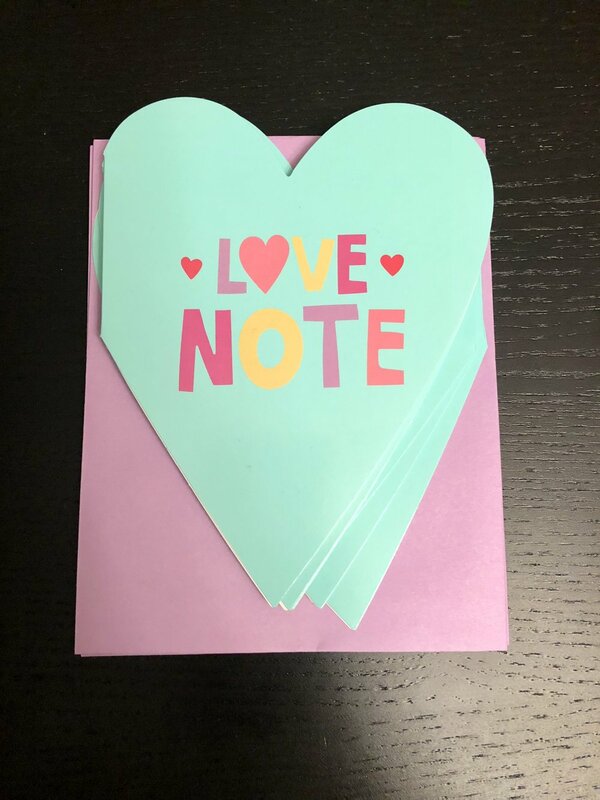 These love notes are especially important because they are filled with uplifting, positive words. If I’m honest, I probably tell myself at least one negative thing, every day. Mama said “if you don’t have anything nice to say, don’t say it at all”. But I’m changing it, if I don’t have anything nice to say, I better find something, because Essie deserves positivity. Just like everyone else. My hope for all of my readers is, now that the Valentine’s Day hype is ending, you can remember to by your own “Valentine” every remaining day of this year, and that loving yourself is just as important as loving those around you. 1 Cor. 13:4 says, “Love is patient, love is kind”. That applies to YOU when loving YOU! So be patient with yourself; if you’re not where you want to be, it’s okay, you’ll get there! If you mess up, be kind to yourself! And above all else, just love yourself, your perfections and flaws included.